QuickBooks organizes your accounting data and generates the income statement for you. Keep tabs on your business’ financial performance. The income statement, also called the profit and loss statement, is used to calculate profits by comparing revenue to expenses. QuickBooks generates the income statement for you in just a few clicks. Because QuickBooks tracks and organizes all of your accounting data, you can easily generate reports to see where your business stands. The income statement, also known as the profit and loss statement, details revenue, expenses, and profits (or losses) over a specific time period. QuickBooks makes it easy to regularly review your income statement in order to evaluate where you can reduce expenses, grow revenue, and increase profit overall. The income statement is one of the three key financial statements used to assess a company’s financial health. The other two are the balance sheet and the cash flow statement. With QuickBooks, it’s easy to generate the reports and financial statements you need to run your business. Easily share reports with your business partners, investors, or colleagues and schedule them to be automatically generated and sent for you. Small business owners use the income statement, also known as the profit and loss statement or the P&L report, for understanding the company’s revenues and expenses over a period of time. The five components of the income statement are sales (or revenue), cost of goods sold, gross profit, operating expenses, and net income or loss. The income statement compares your monthly income to your monthly expenses and shows you the amount of profit or loss over a specified amount of time. This is the best report to review to understand whether your business is profitable or losing money. Many small businesses choose to create income statements on a monthly basis to look for patterns in profits and expenditures. The income statement, together with the balance sheet and cash flow statement, are the central financial reports for any business. They should be generated at least quarterly in order to evaluate the financial health, value, and growth of a business. They are used for financial projections, to estimate the viability of new projects, to set goals for the future, and to secure funding. More than the income statement. Run your entire business with QuickBooks. Connect QuickBooks to your bank, credit cards, PayPal, Square, and other accounts and we’ll import and categorize your expenses for you. Snap photos of receipts and we’ll track them for you, too. Then you can easily run reports to see exactly how every dollar is spent. 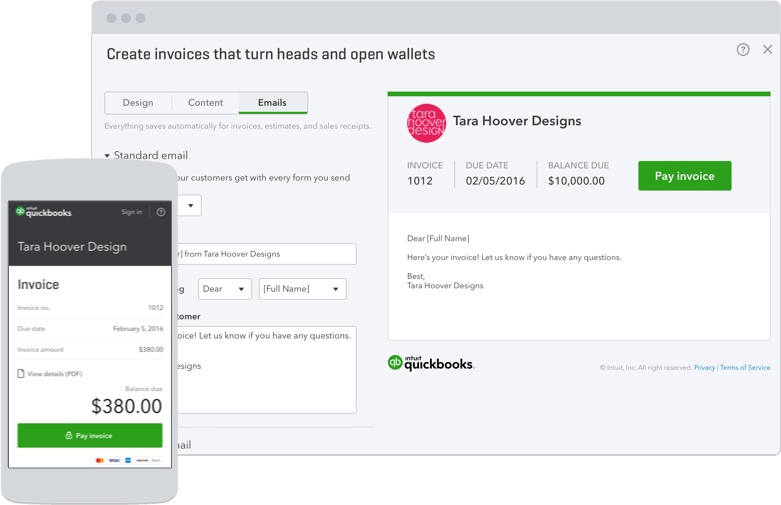 Easily accept payments using the payment system built into QuickBooks. Your customers can choose from a variety of payment options, like credit card, debit card, free ACH bank transfer, Apple Pay, or other payment services. We automatically process the payment, track the transaction in your books, and transfer the funds to your bank account. Most businesses get bills that they don’t pay immediately, like utility bills and cell phone bills. Easily track your bills and their due dates in one place so that you always pay on time and avoid late fees with QuickBooks. You can also set up automatic payments so that your bills are paid via electronic payment for you. The income statement is a recap of your company’s income and expenses over a specified period of time. It includes all expenses incurred to generate your business’s revenue, including interest expense, inventory, and overhead. Did you know that your “bottom line” refers to net income? Countless accounting terms exist, many of which are important for small businesses to understand. A great place to begin is with two of the most common and useful terms: net revenue and net income. If you’re just starting a business, reading financial reports can seem daunting. You may not be familiar with terms like ‘cost of goods sold’ or ‘depreciation and amortization.’ In this article, we walk through the terms on the income statement and translate them as we go. How do I run an income statement in QuickBooks? QuickBooks uses the term Profit and Loss report (instead of income statement or P&L Report) in the navigation and menus. In the accounting profession, these three names are interchangeable and frequently used when referring to the same report. Choose Reports and go to the section called Recommended Reports where you’ll see Profit and Loss. If you want to customize the dates or the format in which the information is displayed, you can do that at the top right hand side of your screen with the ‘Customize’ button.